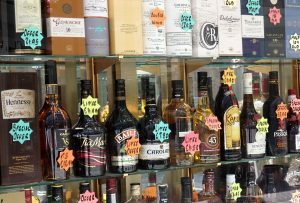 Best Duty-Free Shopping tip – do not compare prices! What is the best Duty-Free shopping tip we can offer to you? Be careful when comparing prices and get to know the rules in advance. If you are travelling soon, planning to shop duty-free and want the best deals, don’t compare prices or at least beware of those online price comparisons. Why? Because, you’ll find yourself running around in circles trying to compare so many products, pack or bottle sizes and prices which probably do not apply to your journey plan, your destination, the currency exchange rate, or where you live. Not to mention the Duty Free Allowances and limits permitted on arrival! Duty Free on Arrival is here to assist you as best we can by pointing out and advising on the pitfalls in advance. We are not here to put a gloss on matters, just to promote one store or another. Indeed we mention duty-free price comparison too on our site, but we suggest you go about it in a more accurate fashion. (see our summary below). The Tax Free shopping blog Tax Free Travel agrees with our advice too with a scathing report on some alleged duty-free comparison sites. Price comparison for Duty-Free shopping is an almost impossible task, because there are so many different variables for each shopper. Not least your currency exchange rates and its daily fluctuation. 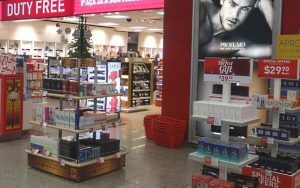 Here’s a good example: All prices in Brazilian Duty Free Shops are based on US Dollars, you will often get your change in US Dollars too, even if you pay in Yen, Pounds or Euros. Or, you might get your change in Brazilian Reais. But probably not your home currency. This makes it confusing and often virtually impossible to compare prices if your home currency is not Dollars. How do you work out what currency you want to pay with and whether by cash or card? Credit Card payment has other issues to be cautious of, because when you buy in some stores, the base currency is US Dollars and not local currency, this payment is then converted back to your home currency. In effect, this means you have two exchange rates to worry about, not one. Another thing to watch out for is DCC or “dynamic currency conversion” where you pay by credit card, but in your home currency, even when you are abroad. This can be convenient, but it may give you an inferior exchange rate? The upside though, is it may save you that +/-3% overseas billing charge when you get home. Either way it is something to consider, before you shop. All these factors can really confuse matters and make many of the duty free prices offered by price comparison sites, invalid or substantially different to the reality. Did you check the bottle sizes for your duty-free offer? And, when you are buying liquids…….. (liquids can mean liquors, wines, beers, perfumes or even cosmetics), watch the bottle sizes being compared very carefully. 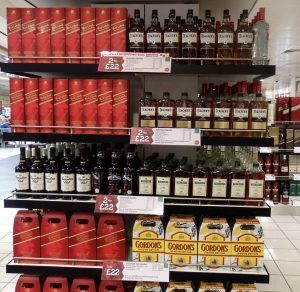 Whisky or Gin prices might be offered in one airport store in Litres, but the comparison site might compare it with 70cl or 75cl bottle sizes? That’s a size difference of 33% …. more than enough to confuse the prices being compared. So, don’t just look at the prices shown on the comparison site or that special promotion, make sure you check the bottle sizes too. Duty Free shopping in Gibraltar near to Spain, but what is your allowance back home? This store in Duty-Free Gibraltar clearly tells you the bottle sizes, but what size do you normally buy in nearby Spain? What is your Duty Free Allowance back home when arriving from Gibraltar compared to the rules from from Spain? In fact, EU residents can only take home one litre from Gibraltar, but from Spain there is no limit, because it is seen as a domestic journey. Each traveler has their own plan, route and objectives, does the online price comparison really give a true reflection? Ask yourself the question before you press that go to my basket button. Confused? For those who want to shop on their travels, we offer our best duty-free shopping tip in a summary…. Compare your prices, but do it yourself, by going to the store’s pre-order website for your destination. (Most airports or airlines now have one). If you see a duty-free online price comparison*, check the bottle or pack sizes quoted? Check the airport stores they compare and make your own comparison, before you buy. In The European Union, many airport duty-free shops have two different prices …. do you know why and is like-with-like actually being compared? Are the prices being compared correctly? There are no hidden secrets to shopping duty-free, the open secret is to research in advance for yourself and make sure that you check before you fly! *Travel Retailers don't like price comparison, unless of course, they know they are the cheapest. So retailer prices are rarely shared with comparison websites. Details are often "scraped" from retailer sites and in Duty Free, where there are many Tax Rules, this means that incorrect, inaccurate or differing products, sizes or prices could be compared. **In India, Australia, New Zealand, Barbados, Hong Kong, Singapore and other locations, duty-free tobaccos cannot be imported into the country. Or, at least, some territories only allow a one pack maximum. **Many countries now restrict the online display and sale of duty-free cigarettes or tobaccos, so the comparing of prices is impossible. The only way to get information is to go to travel forums and ask a question. Internacional: Para buscar tiendas libres de impuestos, catálogos y precios, ingresa tu ciudad, aeropuerto o país de destino y haga clic "Go". Cuando encuentre la información de su destino haga clic en el icono rojo de Aduanas para la búsqueda restricciones aduaneros. Author Arrivals Duty FreePosted on 13th September 2016 6th October 2017 Categories Duty-Free PricesTags bottle sizes, compare duty-free prices, duty free shopping tipsLeave a comment on Best Duty-Free Shopping tip – do not compare prices!